The melodious sounds of birds returning is a sure sign of spring! 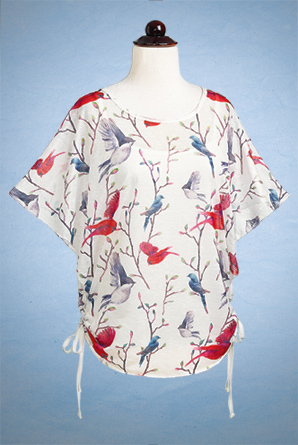 Cheerful songbirds perch on budding branches to brighten this top. Fluttering batwing top with ruched sides has attached stretch-knit cami. Approx. 25" long. Imported. Viscose/elastane/polyester; machine wash, line dry. Sizes S-XL.